Not another brick in the wall rather three packs and a mega value bundle of resin 40mm frontage scenics now at Alternative Armies! Adding to the Castle Wall and Bastion Wall packs we now have Planted Stakes, Wooden Palisades and barricaded Townsfolks Possessions packs. The mega bundle contains all five packs of twelve pieces each with one pack being free meaning a 20% saving. 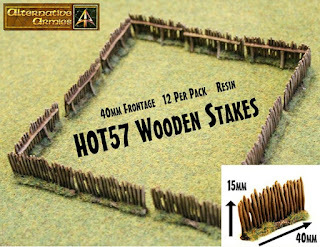 Excellent for use in 15mm scale in systems such as HOTT for strongholds or outer defences and such or in wargaming in general. 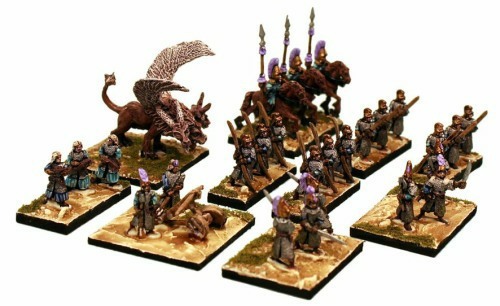 Once they were white metal and now they are resin and a dozen to the pack. Superb! 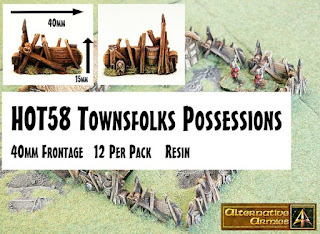 (The image above is of a pack of HOT58 Townsfolk Possessions with HOB1A and HOB1B Hovels plus three Furioso element bases including MRX1 Early 16th Century Cannon with Crew). 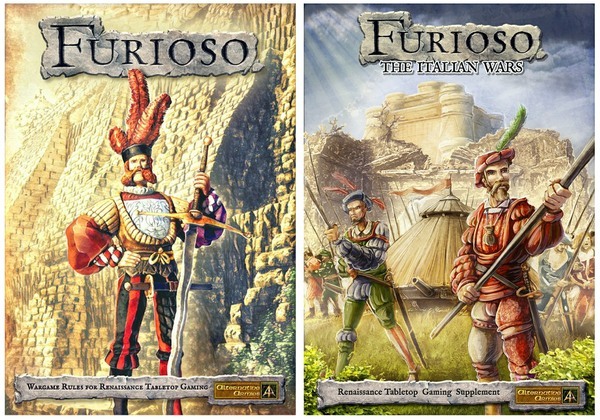 Go to the HOT 15mm Fantasy Range or to the 15mm Renaissance Range (where Furioso lives too) or read on for more information. 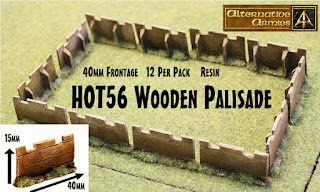 A pack of twelve identical resin pieces each a re-enforced wooden palisade 15mm in height and 40mm width. Make 480mm of frontage to form enclosed spaces. Great for any suitable system such as HOTT, Furioso, DBA and more. See more images on the page. A pack of twelve identical resin pieces each a row of upright wooden poles with sharpened tips 15mm in height and 40mm width. Make 480mm of frontage to form enclosed spaces. Great for any suitable system such as HOTT, Furioso, DBA and more. See more images on the page. 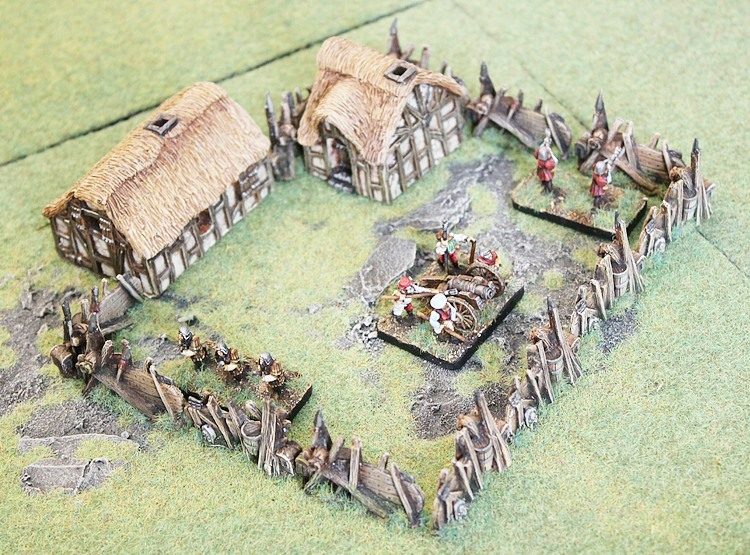 A pack of twelve identical resin pieces each a barricade of spears, chests, shields, cart pieces and more 15mm in height and 40mm width. Make 480mm of frontage to form enclosed spaces. Great for any suitable system such as HOTT, Furioso, DBA and more. See more images on the page. There are five different packs of Walls in the HOT Range (HOT56 to HOT60) and this saver bundle gives you a pack of 12 of each of them with the added bonus that you only pay for four of the five packs! Saving 20% off regular price. 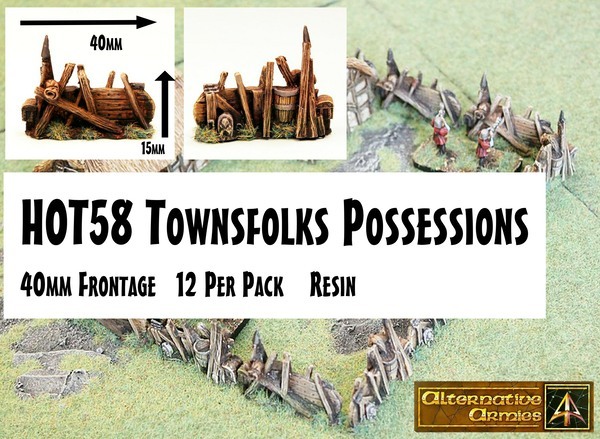 A great way to get stone, bastion, wooden, stakes and townsfolks possessions for your battlefield. 2,400mm of frontage in 40mm lengths! 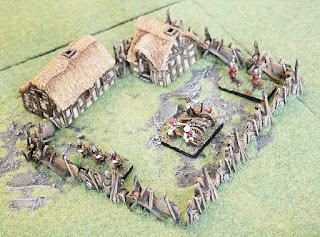 We have a range of 15mm resin excellent buildings which go well with these walls and also fantasy and historical wargaming. See the HOB Range HERE. 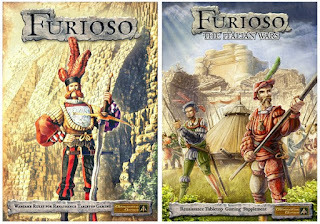 Lastly we are in the 'March to War' event just now at Alternative Armies and this lasts until 16th April. Free Worldwide Shipping, Free Carrot Heap and thirteen new releases all in this event period. 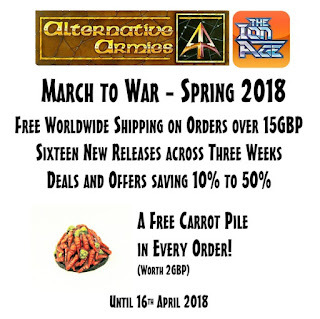 Spent 15GBP or more and you get your package post free. Read full details on our blog HERE.